A new trailer has emerged from E3 showing off more of Nintendo’s newest addition to the Paper Mario franchise: Paper Mario: Color Splash. The newest trailer shows off a lot of new features to the game, as well as a release date. 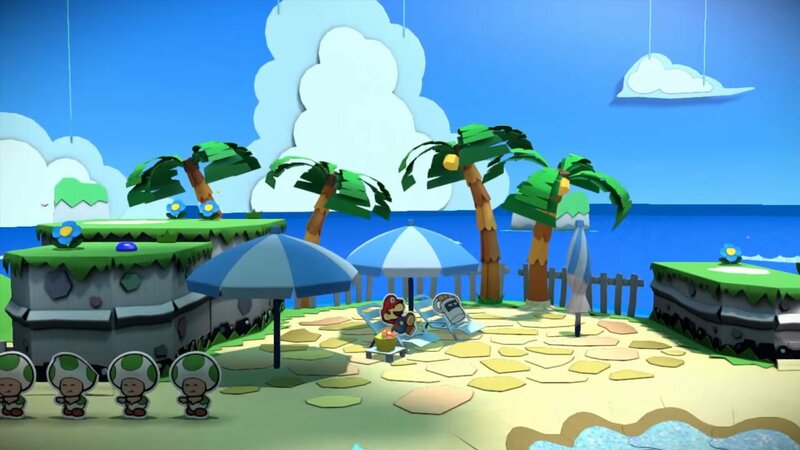 The trailer gives a short glimpse into some of the story of Paper Mario: Color Splash, showing what may be the most cinematic Paper Mario to date. Clever use of camera angels show a game that no longer looks as flat as the material it’s based on. The addition of HD and atmospheric lighting makes Color Splash look gorgeous also, with many of the environments shown within the trailer having an incredible amount of detail, while maintaining its paper aesthetic. The trailer also shows a little bit more of the puzzle elements, where players will cut out pieces of the world to reach new areas. Much like Sticker Star, Color Splash looks as if it will play very heavily with the ideas that the entire world is made of paper, which is also shown a bit in the combat, where a Shy-Guy folds the battleground and Mario must run away from being flattened. This suggests that Color Splash will include more interactive attacks, much like the ones seen in the Mario and Luigi RPG games. While not a lot of details on how combat works, in relation to the cards and paint gauges were shown, Color Splash’s combat looks like it will be fast-paced and fun, while still paying homage to the series’ RPG roots. Color Splash also looks as though it will blend several types of gameplay, keeping true to the spirit of the franchise. A section where players are painting roads while running against the clock, or riding on the back of a massive lava dragon make Color Splash look interesting, and if it’s anything like Sticker Star no two levels will be the same. As one of the few people who genuinely think Sticker Star is a good game, I’m extremely excited to see how Color Splash will work and evolve the Paper Mario franchise. October 7th, 2016 cannot come fast enough.